When it comes to counting, children about 2.5 and up begin with memorizing the sequence of numbers; rote counting. As they get older, they will start counting with understanding; rational counting. 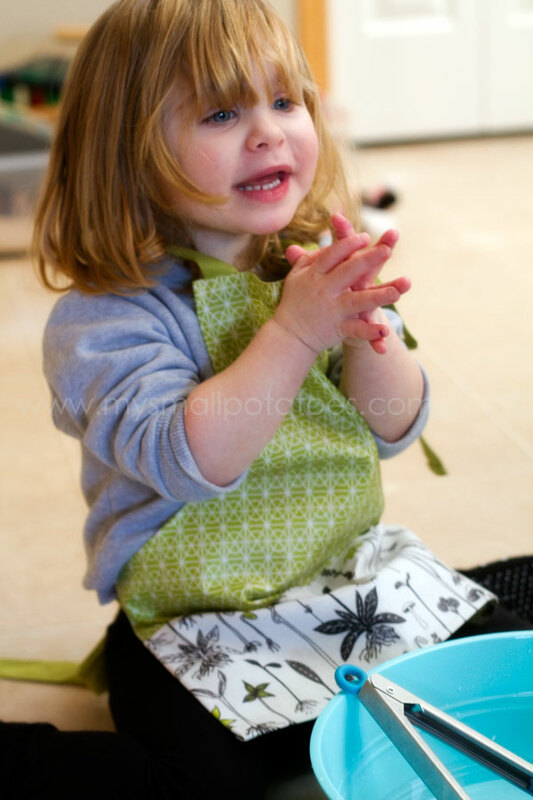 In order to count with understanding, the smalls need to understand one to one correspondence. One to one correspondence is the ability to match one object to one corresponding number or object. An example would be 2 feet to 2 shoes. 12 muffin papers to 12 holes in the muffin tin. Or even simply counting your fingers, matching the number with your fingers as you go. 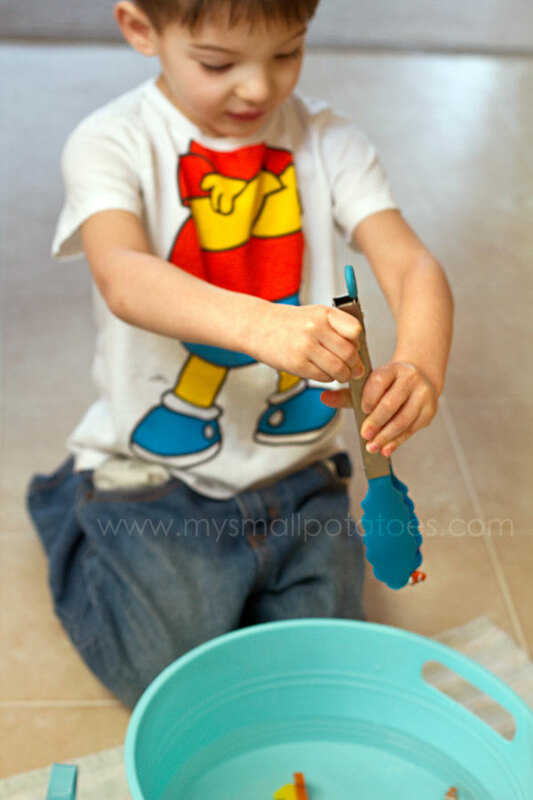 You probably will notice in really young children, that they will hold up incorrect finger amounts as they count to five on their hands, or they will count all the way up to 10 when their are only 6 objects in front of them…they have not yet grasped the concept of one to one correspondence. This is quite alright, in fact it’s perfectly normal. It comes with age and experience, just like any other skill. One to one correspondence can be practiced ANYWHERE! You can count cars with your child as they pass, count bites of food as they reach their mouths, count their little toes in the bathtub, count the animals in the story books you read together. There are so many opportunities…you will see them the more you look for them. 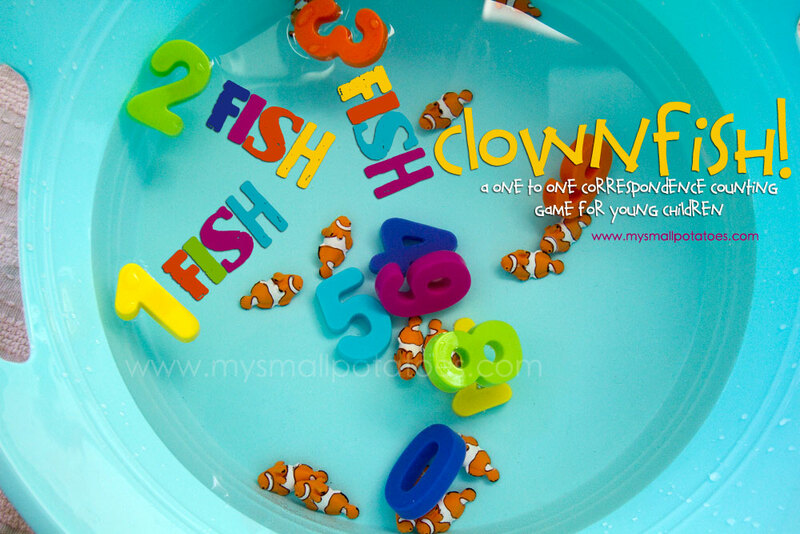 To help the smalls practice their one to one correspondence, I made a little fishing game for them. I am a huge believer that learning should be colourful and fun, and should not feel so much like work, so I gathered a few simple things from our toy shelves and we got started! MATERIALS NEEDED: *You can use any fish you have on hand, or frogs, or shells, or whatever you like. 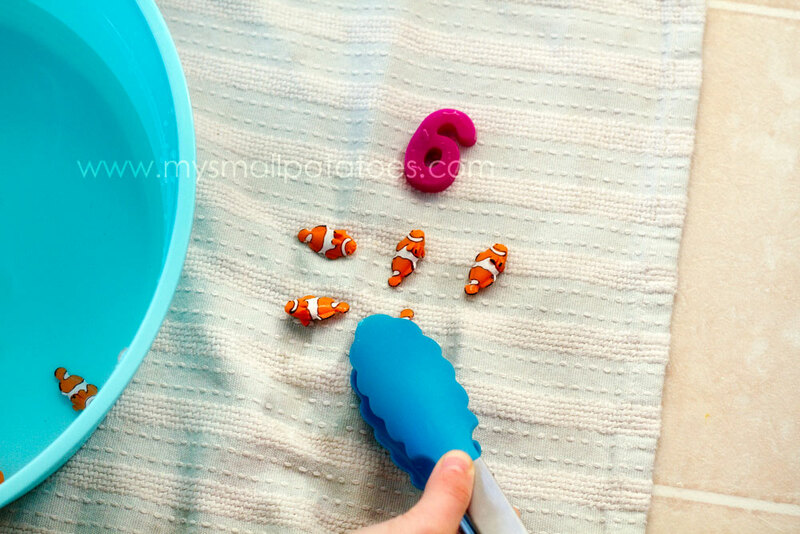 We used the Safari Ltd. mini clownfish because they are so bright and colourful and easily distinguished from the numbers. I purchased them here at T.G.F Toys. 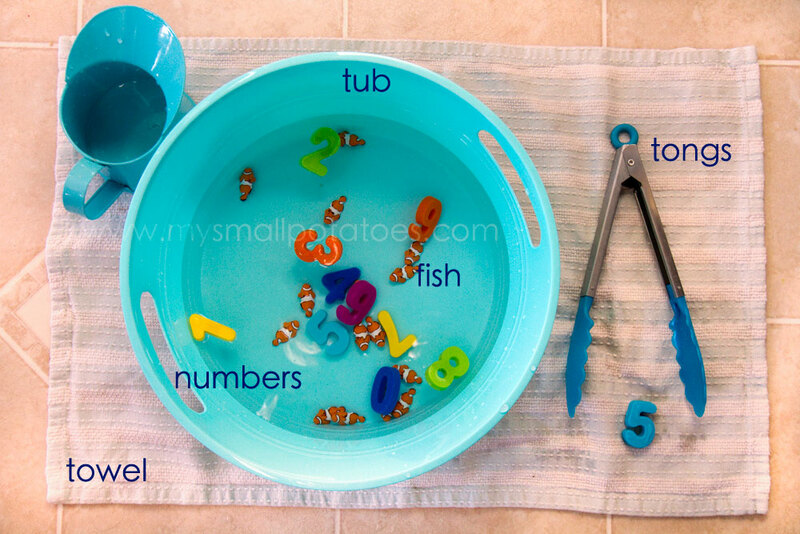 The children first fish for a number with the tongs and place it on the towel beside the plastic tub… This in itself is a tricky task! 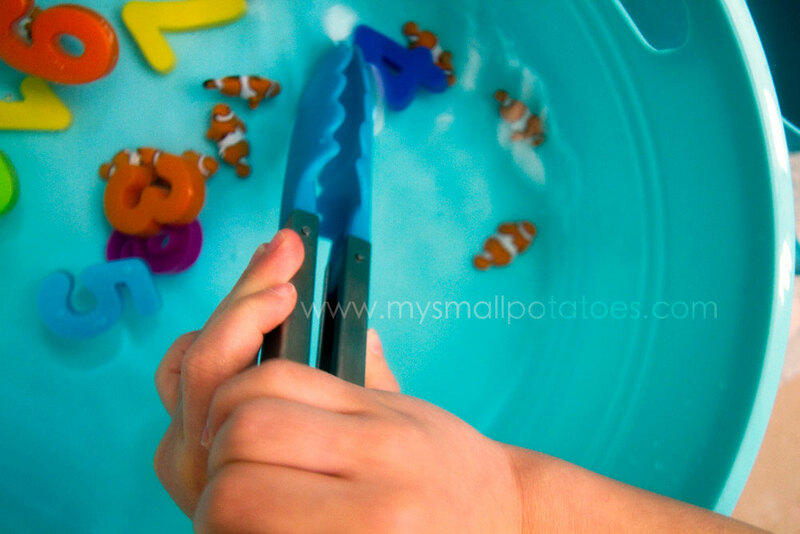 Once they have a number, they can start fishing for the corresponding amount of clownfish… Using the tongs is such a great way to practice their small motor skills and eye-hand coordination. 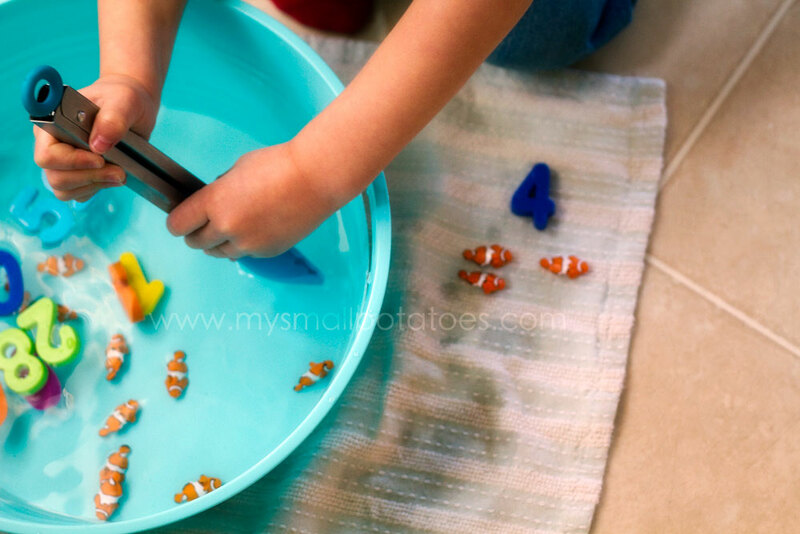 The smaller children may even need to use two hands to navigate the tongs… The children are always so pleased with themselves when they catch a fish! 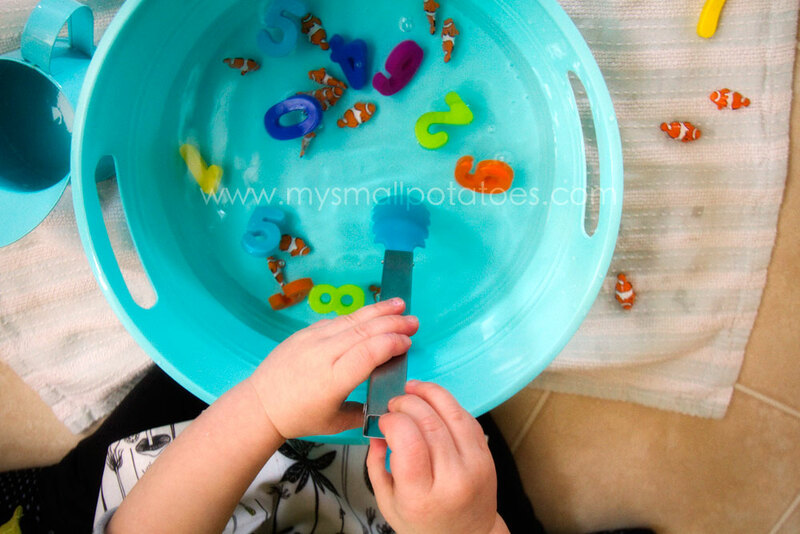 They can practice one to one correspondence while they drop each fish on the towel, counting them as they drop. 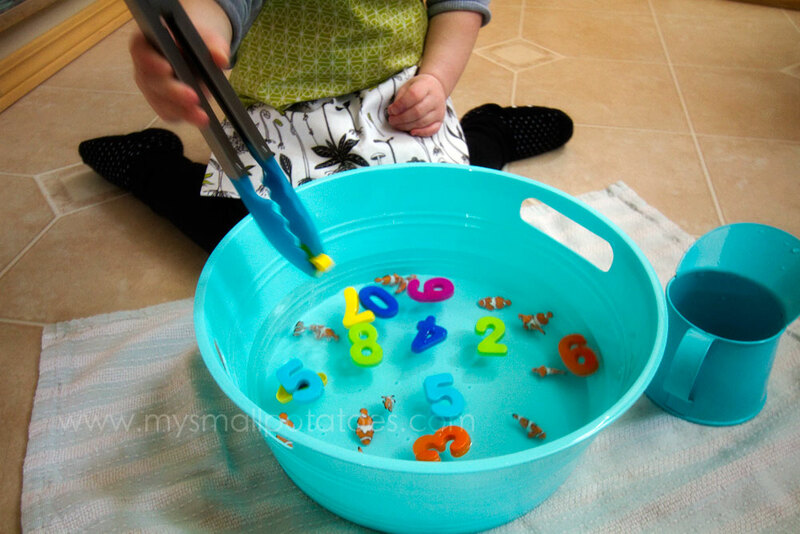 You can also help them work out how many more fish they will need to complete their task. Once they have all their fish caught and on the towel, have them count each fish. 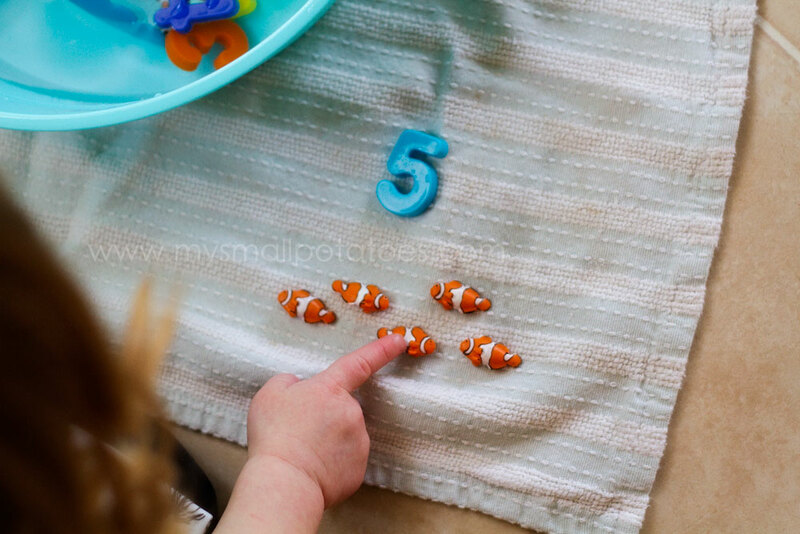 It is important that they touch each fish as they count it, reinforcing the point that the object corresponds with the number they are saying aloud. When I could tell the smalls were tiring of the fishing and counting expedition, I allowed them time to freely play with the fish and the numbers as they pleased. When learning becomes frustrating, we turn to playing…after all, these kids are just 3 and 4 years old! They have lots of time to learn and grow! *You may have notice I added a little pitcher for pouring and scooping. This was added to the list of materials needed simply as an option for free play. Thanks for stopping by, and happy counting! Fantastic idea! My boy is too young for this still but it is definitely going onto my Pinterest board. Thank you for sharing, your pages are truely inspirational.